Ubud, the luscious rice paddy covered center of Bali! A town that became popular after Liz (Julia Roberts) learnt to find balance for herself in the movie of ‘Eat, Pray, Love’. A town in Bali that probably has as many tourists as cars and scooters, all competing for space on the narrow little roads. A town buzzing with activity … buzzing with atmosphere and an incredible vibe. I love the ‘feel’ of this town and I loved discovering the narrow little lanes that were a touch less busy than the Ubud main streets. There are so many wonderful things to do in Bali that it was slightly challenging narrowing it down to the best things to do in Ubud. As Ubud is such a popular tourist hotspot in Bali, it comes as no surprise that there are plenty of Ubud attractions to check out! 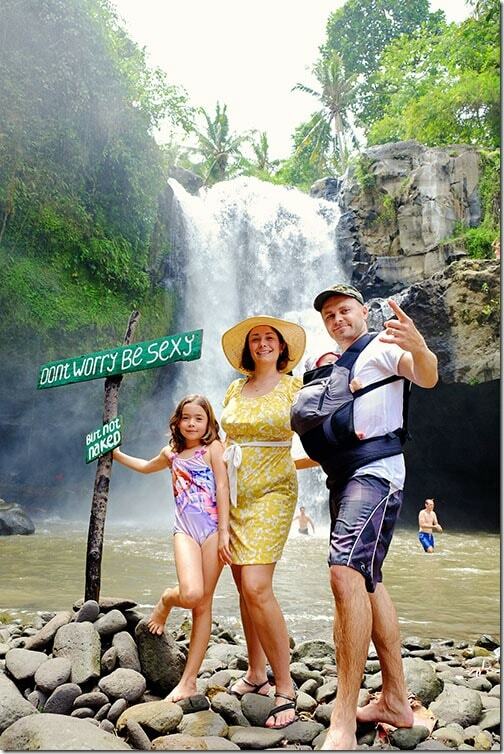 Ubud is also a great place if like us, you are traveling with family. 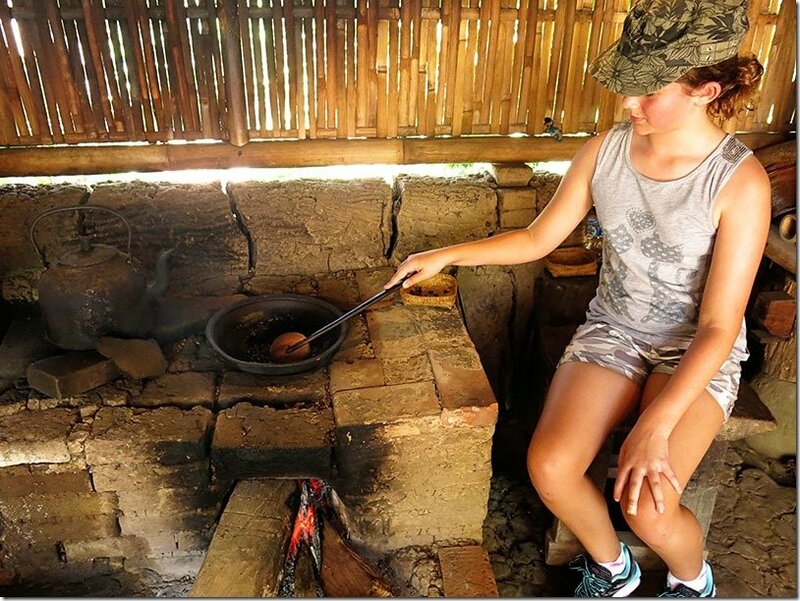 All of these points listed below are great to include on your list of things to do in Ubud with kids. 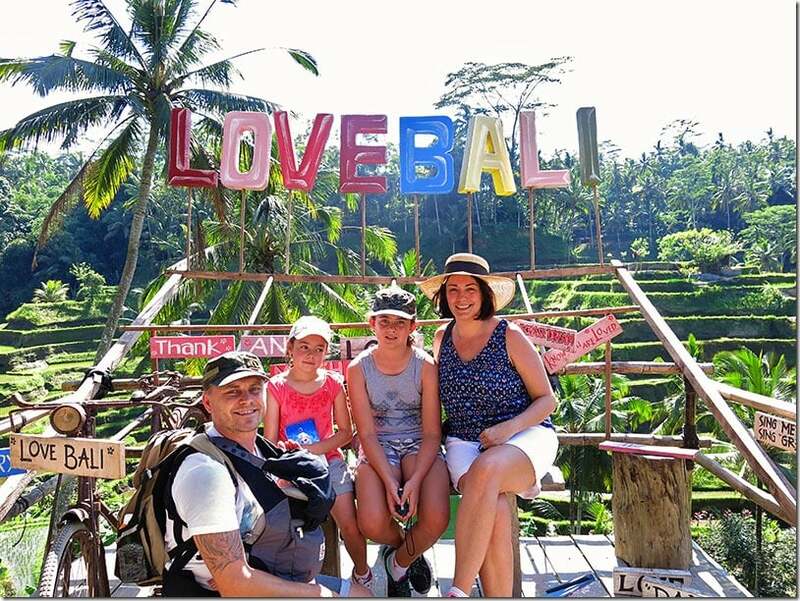 Travelling to Bali with kids have become increasingly popular as it happens to be such an easily accessible paradise location for Australian families! 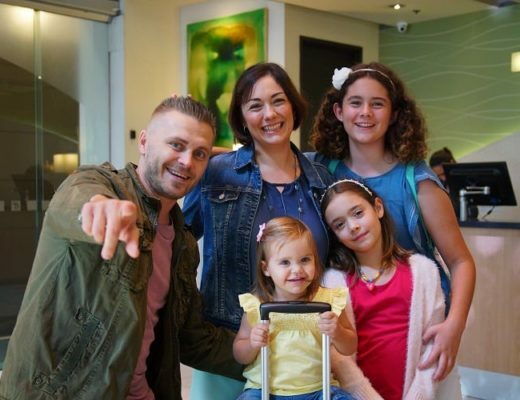 We travelled with our 11 year old, 7 year old and our tiny little 2 month old baby and we had an incredible time! Find below our list of the top 10 things to do in Ubud. We do highly recommend that you spend at least 3 nights in Ubud to make the most of the area. Located in central Ubud, you will find the buzzing market area! Whilst it is totally geared towards tourists, we loved walking down this little alley, squeezing past the other tourists on hunt for some unique little bits and pieces to take back home! 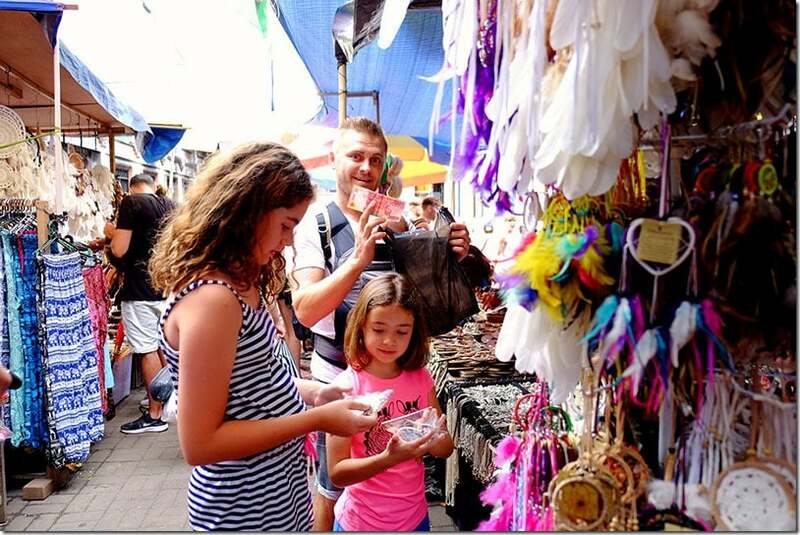 The kids had fun with their pocket money as they went on a search for their own little souvenirs – it is always good for them to practise purchasing goodies and here in Bali of course they can learn all about bargaining as well. We always collect unique little trinkets for our Xmas tree from each country we visit, so we had fun trying to scout out something that screamed Ubud that we could hang on our tree! The result? Some monkeys of course! Do make sure you visit the markets in Ubud! Of course the main reason for visiting Ubud in the first place is to visit the most luscious and stunning Ubud rice terrace fields. One of the more famous of the Bali rice terraces happens to be this one – Tegallalang rice terraces and believe me when I say that they did not disappoint. 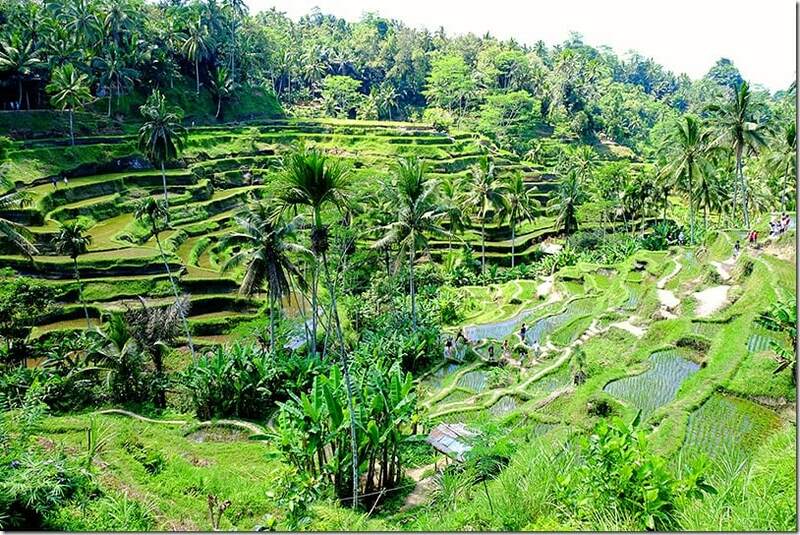 Located around 25 min from Ubud central, you will find these terraces to be a beaming buzz of tourist paparazzi. Along the upper ridge of the terraces you will find a long row of arty stalls, together with a large variety of cafe and restaurants. There are also a few stalls along the walk that ask for a donation in order for you to walk further (we only donated 5000 IDN, which only equates to .50c AUD) and you will also find that the locals working in the fields will ask for money if you point the camera in their direction. I know this might sound a bit overwhelming, but we still enjoyed the walk and the views and didn’t find that any of the locals were pushy at all, so do go and enjoy the fields. Tip: We highly recommend you were good walking shoes for this activity as the pathways can be a bit muddy and slippery! We asked our driver to make a stop at the Coffee Plantation, Bali Pulina, that is located within a few minutes drive from Tegallalang rice fields. We weren’t exactly too sure what to expect and whilst I did enjoy our stop there, I think I was somehow expecting the stop to be more of a natural farming type environment. Instead we were greeted by our tour guide who very quickly walked us through the production process of the famous Luwak (wildcat) coffee. In essence the wildcat eats and part-digests the coffee cherries, after which they poo out the coffee beans. These beans are then cleaned and placed in the sun to dry. It is then peeled before going through a roasting and grinding process. Such a bizarre concept and it left us wondering how on earth the person that discovered this type of coffee decided to taste test the poo from this animal?? Totally weird right? 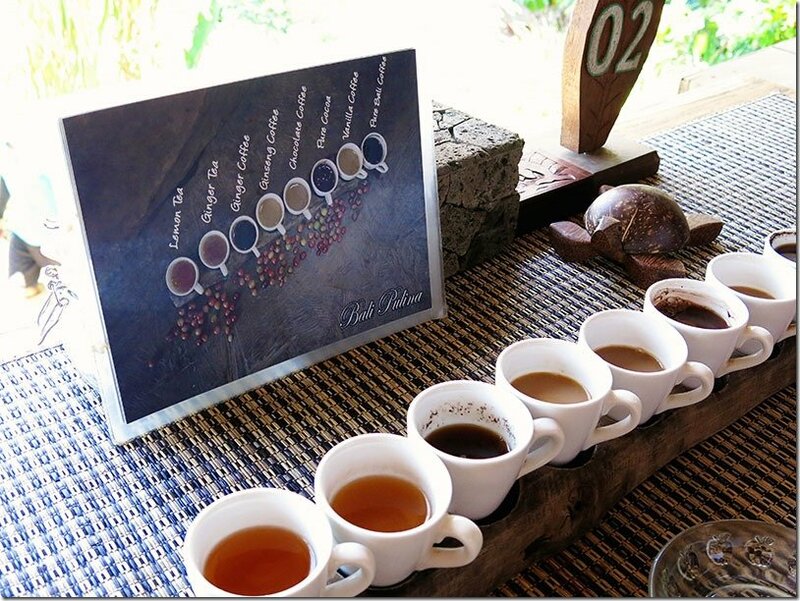 After the very quick tour, you also get to try out a variety of different teas and coffees, we all (even the kids) loved taste testing and could not resist buying a packed of the Lemon Tea and the Ginseng Coffee – yumm!! Whilst we enjoyed our stop here I did feel a bit uncomfortable about the fact that the Luwaks were locked up in small cages for our viewing. Your stop here won’t cost you much as the informative tour as well as the taste testing coffee and teas are free. If you do want to try the Luwak Coffee, it will set you back by 50K a cup. After visiting the Coffee Plantation, our driver decided that it would be best to visit the Tirta Empul Temple next. This Hindu holy water temple is an important site for the Balinese, so much so that it carries the title of being a national cultural heritage site. 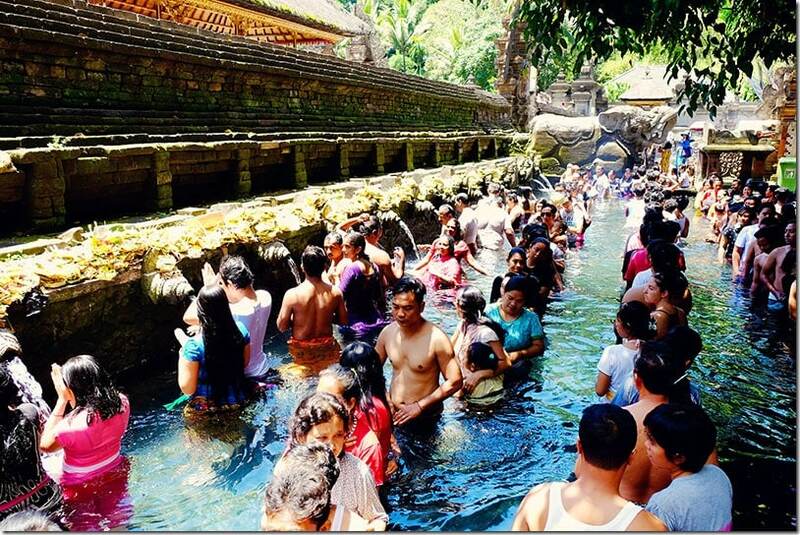 Tirta Empul actually means ‘holy water spring’ and you can witness this underground water source bubbling up in one of the sections of the temple. This spring feeds the various purification baths, pools and fish ponds. 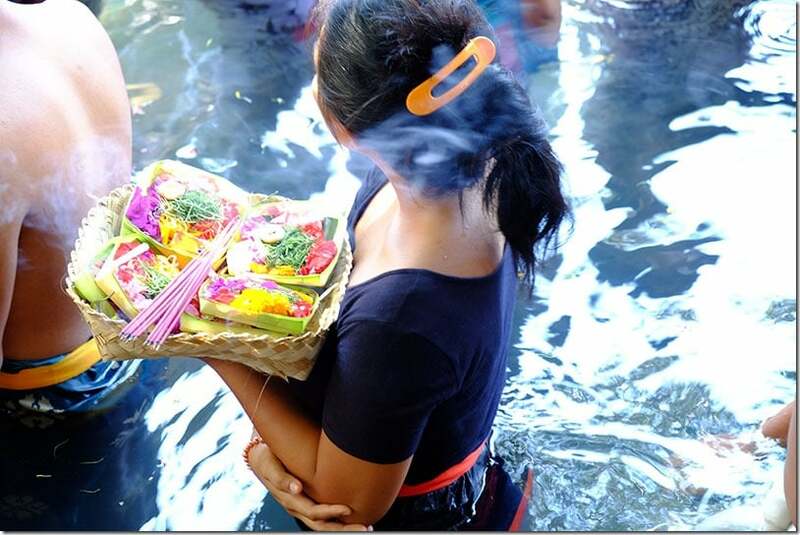 If you would like to read more about the rituals that lies behind these purification baths, you can do so on the Bali Indonesia official site here. Dress: As this sight happens to be a holy site, you will be required to wear a sarong or sash. You can easily borrow a sarong at the entrance to the temple, although many tourists like travelling with their own sarong in their backpacks. The Campuhan Ridge Walk is a great one to experience. 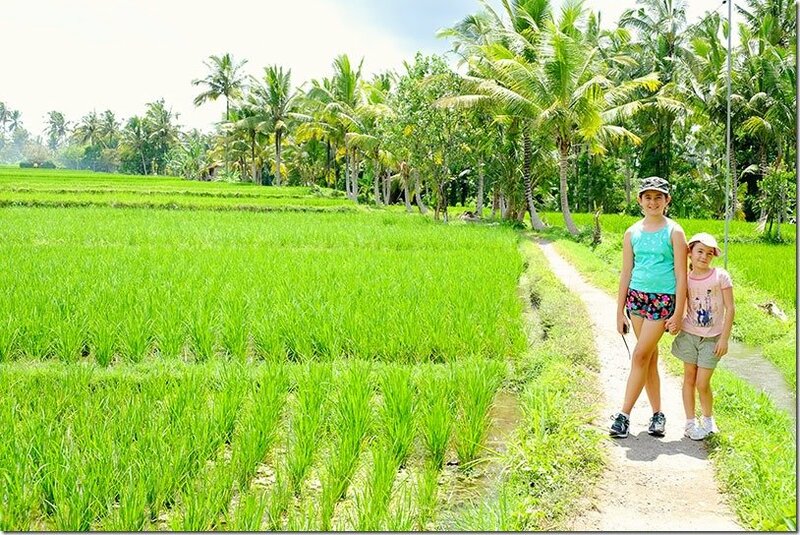 It was fairly easy for our kids to do and we enjoyed some green scenery of valleys and forests that was different to the rice paddy covered Ubud. The ridge is so well known as there are valleys down either side of the pathway, this sections name means ‘where two rivers meet’. The two rivers are Sungai Wos and Sungai Agung. We enjoyed our walk with a tour guide who was sharing all his wealth of information with us about the region and about how the locals live their lives here. As we walked we noticed that we were walking in the opposite direction in comparison to all the other tourists, however as guides always knows best, we also noticed that he took us the easier way which meant that we had fewer hills to climb. You can read more about this walk with our tour guide here! Tackle this walk in the early morning or late afternoon as there is very little shade to provide relief from the hot Bali sun. Walk this track in one direction and then grab a taxi to take you back to Ubud or your hotel. 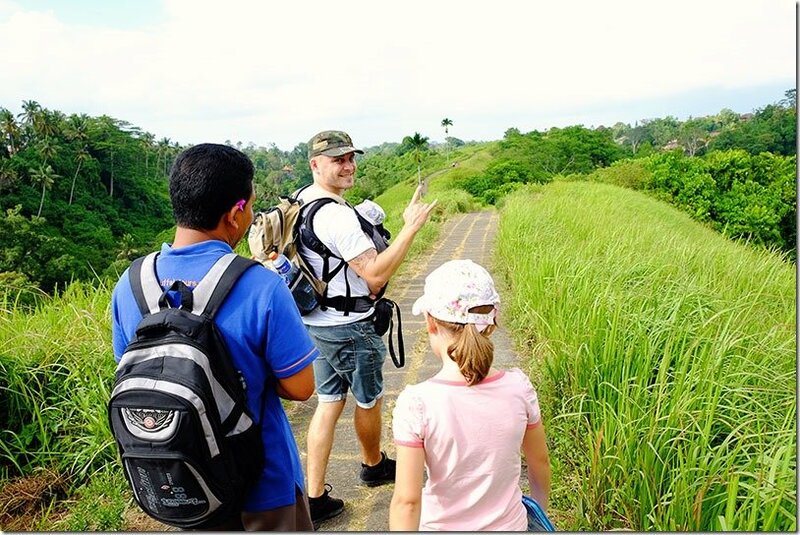 Whilst most people tackle both the popular Ubud Walks (this one and the Jalan Kajeng Walk) in one day, it would be best to break these up into separate days for the sake of the kids. We did both and it was just a touch to much for our munckins. If you do not have a guide, it will be easier to start the track at IBAH Villas & Suites, however you will tackle the walk in the more challenging direction with a few more hills to climb. 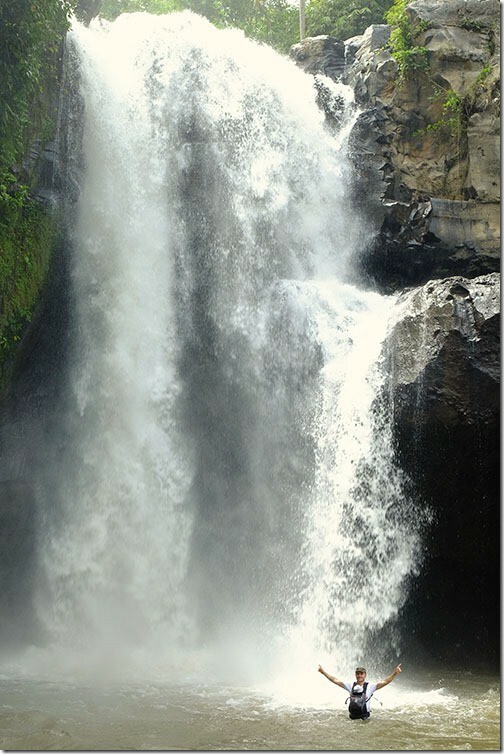 This spectacular waterfall is reached within a short drive from Ubud. You will find it within the Tegenungan Kemenuh village, in Gianyar and it makes for a truly fun day out! Getting down to this waterfall is a complete mission in itself though so if you have younger kids, you might prefer to view the waterfall from the top and to leave it at that! We enjoyed lazying around the bottom and watching all the tourists come and go. Everyone had a turn at posing for their photos and trying to get as close as they could to the thundering water pouring down from the cliff. Whilst it was fun getting up close and personal to the waterfall, it was a truly hard mission to climb back up all the stairs to the top where our driver was waiting for us! Our kids (aged 7 and 11) managed the climb back up to the top much better than us parents did! Tips: There were toilets at the bottom, but you had to pay to use them (I didn’t use them so not sure if they are western toilets). There were also some stalls at the bottom who were selling some drinks and snacks. The climb to the top was HOT, so make sure you head to the waterfall in the morning (if you prefer the waterfall to be in the shade) or in the late arvo (if you prefer a sunny waterfall). I think my favourite thing to do in Ubud was this walk. I love the lush green scenery, I loved all the little cafe’s lining the path, all the yoga signs. I loved watching the locals go about their daily lives, plus the trees provided a bit more shade than on the other walk. This walk through the Ubud countryside is pretty easy as it is fairly flat. The start point for this route is within a very short distance from central Ubud, beginning at the western end of Jl Raya Ubud. Look for signs pointing to the Ricefield Walk and Sari Organik Cafe. Whilst strolling through the countryside here, why not stop at Sari Organik Cafe and enjoy a light lunch or a drink? To go or not to go, now that is the question! We all know that the kids will most likely find the monkeys adorable to watch and sure some of them, especially the gorgeous little babies are simply too cute to walk away from! I bet that most people have the Ubud Monkey Forest high on their list of places to see in Ubud. And so many people absolutely loved their time there! However it is important to note that a lot of people have also had a bit of a scary visit here with these unpredictable animals. Years ago on my previous visit to Bali, I visited another monkey forest and I did enjoy my time there but i also did not feel 100% comfortable with them either. I had some of the larger monkeys scramble up my back, I still have the scar from the scratch marks of one of these monkeys on my back as proof! Ultimately, we didn’t feel that it was a safe place to take our kids, especially not with our 2 month old baby, so we gave it a skip! If you do choose to go, do ensure that you do not have any food on you, not even in your backpack! Also do not take any valuables in there with you, these monkeys will easily swipe your sunglasses or phones or wallets! They are pretty sneaky and totally used to masses of tourists visiting them each day. 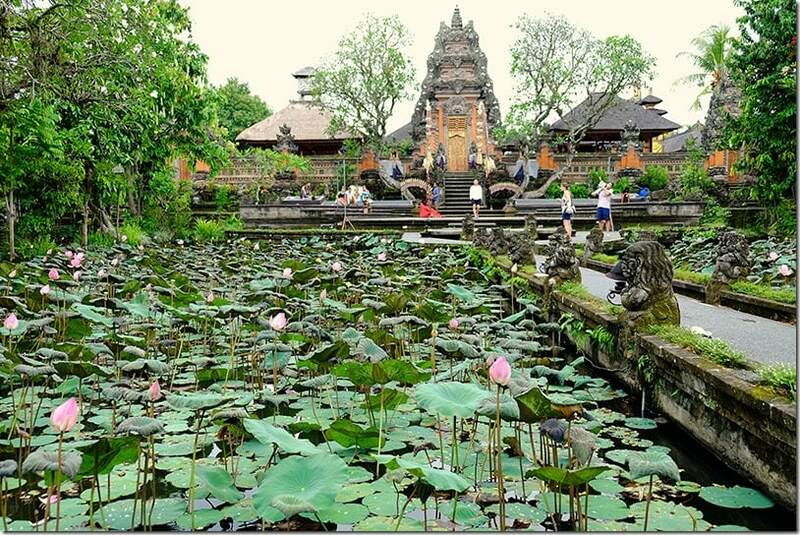 The Saraswati Temple is located on the main street of Ubud (Jalan Raya Uud), hidden away behind the Lotus Pond Restaurant close to Starbucks. The temple is a unique one as it features a large Lotus pond in the front. The water in the back of this temple actually feeds this Lotus pond. The temple is in honour of Dewi Saraswati, the goddess of wisdom and the arts. The temple also happens to have regular performances at night so make sure to pop by after hours as well! Entrance here is free. I think that Ubud is one of my favourites places to visit in Bali! I truly love the atmosphere and the vibe in busy Ubud central, whilst you can still enjoy some peace and tranquillity by only walking a few streets away and getting lost in the countryside. Ubud is changing pretty fast, more hotels are popping up, more rice paddies and lush greenery is lost as a result. 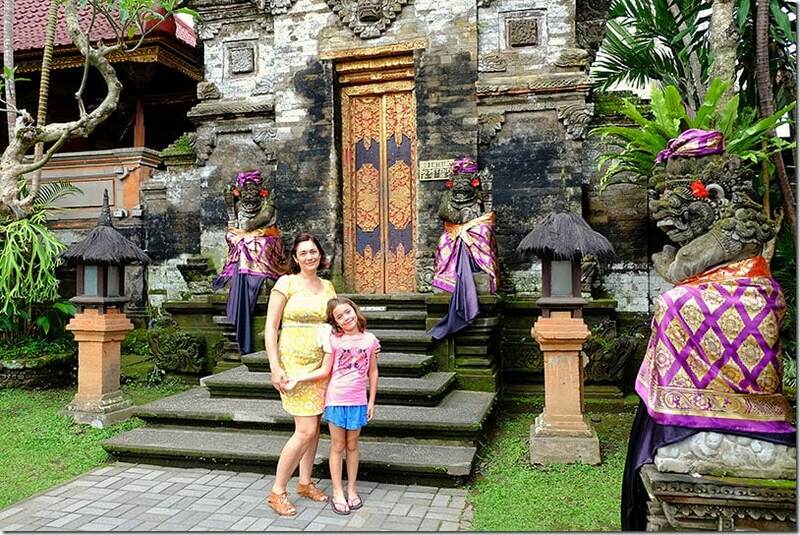 So to enjoy Ubud with your kids, it might be best to book that trip sooner rather than later! But for now … Ubud I still adore you!!! And I can’t wait to return! Only have time for a day trip to Ubud? Join a VW Safari tour that will take you from Kuta to Ubud, with some stops at popular attractions along the way. What pulls you most towards Bali? The beaches or the rice paddies? 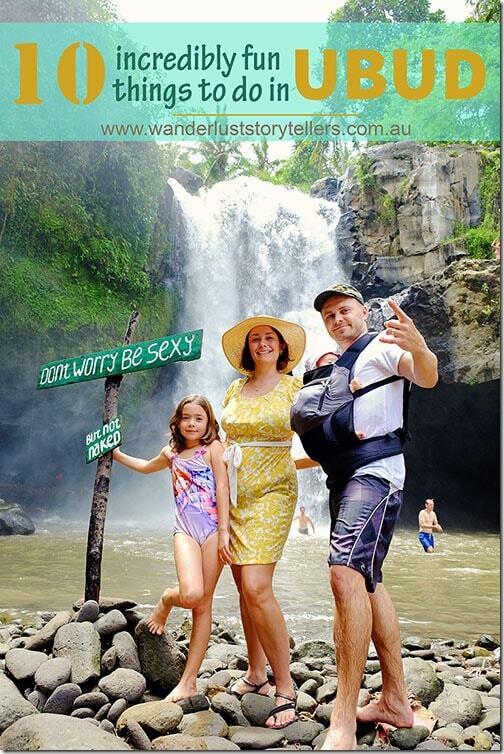 Would you travel to Ubud with kids? Which of these Best Things to do in Ubud would you like to check out first? What to do in Melbourne when the Kids are in Charge of the Itinerary! Hi, thanks so much! 🙂 With the transfer we pre-booked a van with a company that could offer a baby car seat, as our little bubba was only a few months old. Not all transfer companies have baby car seats 😉 But for those travelling without kids, we would recommend using Uber as they are typically heaps cheaper. Tegenungan Waterfall is really nice and very easy to get down there. But once you have to come up it can be a bit challenging. So make sure you wear comfortable shoes, light clothing and probably swim wear if you are interested in having a dip. Sometimes they won’t let you swim if the weather is bad. Yes, the walk up was a challenge! But totally worth it though.